If you want to put Denis Phillips in a box, make sure it’s a big box — to quote singer/songwriter Dan Bern — “with lots of windows, and a door to walk through.” Call that box, if you will, “one of Utah’s most talented abstract painters,” as Bob Olpin once did, but make sure it’s a duplex of a box (at the very least), to fit both Phillips’ expressionist and his hard-edge stuff; with maybe an annex for those overall paintings; a guesthouse for the landscape work; and an ample garage to house everything else: the drawings, sculpture, collage, found objects, etc. As mild-mannered as he may be in person, Phillips is a creative manic in the studio and you’ll find a surprising variety of his work — from all the boxes mentioned above, plus more — at his show this month in the Dibble Gallery, Phillips Gallery’s more intimate downstairs space. 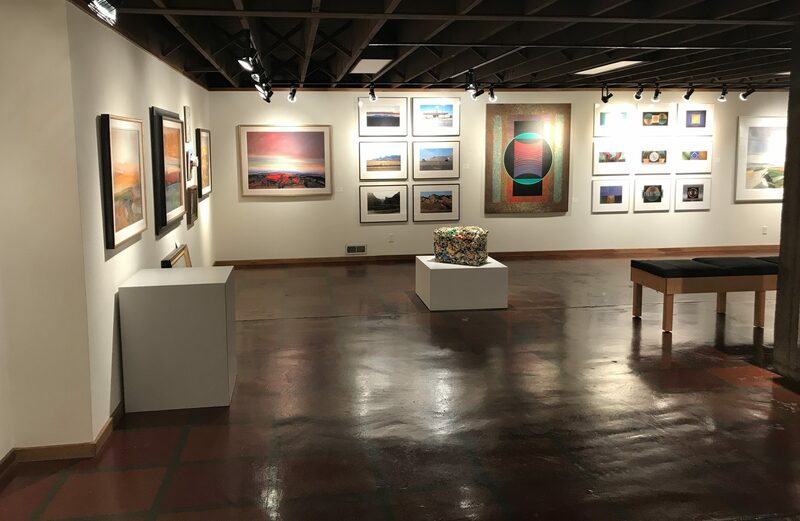 As one of the gallery’s big hitters (not to mention owners), Phillips usually shows upstairs, but the artist says he’s always wanted to show in the Dibble. Besides, he needed the upstairs gallery for the exhibition he’s curated of the work of 45 artists, spanning a hundred years of Utah art. It may be hard to tell when Phillips’ exhibit starts. Halfway down the stairs, the gallery tags transition, without fanfare, from the gallery’s traditionally printed tags to ones hand-drawn by Phillips, announcing that yes, that digital collage of a dozen nostalgic images or that southern Utah river scene in oil are his, are part of the “show.” Turning the corner into the gallery proper, the additional landscapes that greet you on the first wall may be a surprise for those who think of Phillips as an abstract painter. His scenes of the southern Utah desert or Wasatch farmland prove he can hold his own with the state’s many landscape painters. More impressive are his works inspired by the landscape but filled with the abstract. 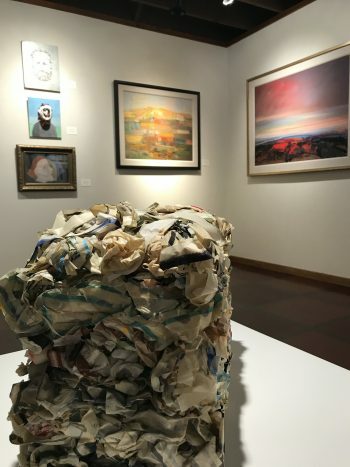 In “Canyons,” he uses the palette knife like a trowel, building up layers of color, like so many millennia of geologic time, so that in the micro we see scores of abstract expressionist moments, made dynamic by color and weight, but the macro becomes easily identified with what we might see down any canyon of the Colorado Plateau. 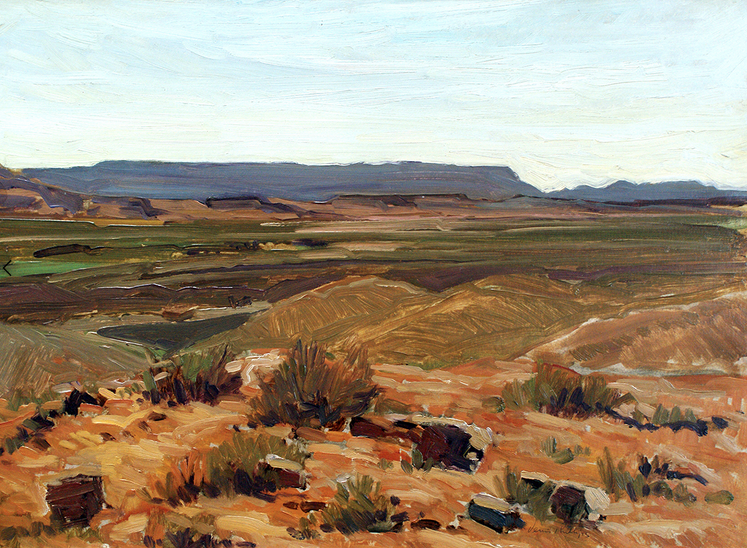 Equally exciting are the paintings based, as their titles suggest, on the San Rafael Swell. The landscape is seen from a high vantage point, the earth below evoked by various mark-making techniques fighting for attention and providing a base for the works’ real focus, an expansive, sweeping, color-infused sky. Seeing these works in the context of the upstairs exhibit, you’ll notice the cues Phillips has taken from predecessors like George Dibble and Doug Snow, while making these works wholly his own. Phillips builds up his surfaces in a markedly different way in the kraft paper paintings, where drips, sprays and blotches of paint pool into shifting clouds of color. In these works, one suspects the artist has used an airbrush before, but wanted to make its results more “human,” so turned to a spray bottle. The surface for these works — chosen possibly for its easy ability to quickly absorb the paint — may have one worrying about their archival quality (the Plexi surrounding one example will not do much to assuage doubts) but the expansive, shimmering quality of the paintings — they look as if they’ve been dipped in the Milky Way — should be sufficient recompense, however long they’ll last. In “#982,” one of the show’s largest works, Phillips has incorporated this paint-splattered technique into its seemingly opposite, the hard-edge designs which were part of his last show at Phillips. He isolates the paint dusting into bands of color — turquoise here, carmine and magenta there — framing a central, hard-edge motif. In these works the compass and ruler (and plenty of masking tape) replace the brush or trowel. The motifs are crisp, the colors almost digital, but the feel of the computer age is kept at bay by the background spattering of hues that, despite our habituated prejudice, never become simply “pixelated.” In nearby grids of smaller works, this flirtation with the digital takes full form with an array of inventive designs displaying sophisticated understanding of both color and design, though these “giclée” works, as they are identified, don’t bear a closer gaze as well as the original types. Also in giclée reproduction are drawings and figurative work, as well as the artist’s digital collages that bring together cartoons, drawings, and found images in visual conversations that deserve a review of their own to be fully appreciated. 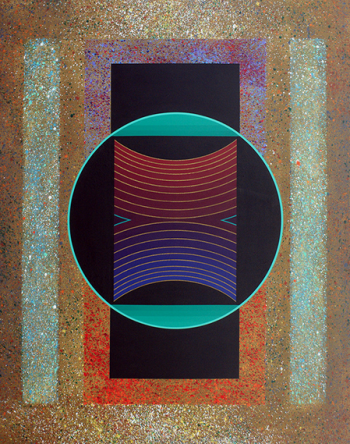 Denis Phillips, Phillips Gallery, Salt Lake City, through Feb. 9.